Description: The article investigates selection of construction of a power pneumatic cylinder that effectively uses power of compressed gas. The mathematical model was built for estimating of parameters of the pneumatic catapult which supply a necessary flight velocity to unmanned aerial vehicle with limitation on longitudinal overloading, for determination of the power pneumatic cylinder parameters and for performing an optimization of catapult parameters. Represented approach to selection task of the design and to theoretical determination of parameters of a catapult with multistage power pneumatic cylinder drive can be implemented for development of unmanned aerial complexes. Grekov, V.F., Kurenko, O.B., Piankov, A.A. and Tkachenko, Iu.A. 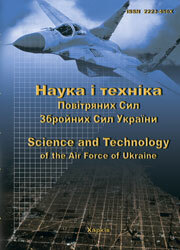 (2013), “Nazemnoe puskovoe ustroistvo bespilotnogo letatelnogo apparata s pnevmoprivodom”, Science and Technology of the Air Force of Ukraine, No. 3(12), pp. 40-43.